Other Products: White card stock, VersaFine Black Ink, paper trimmer, scissors, Gemini Die Cutting Machine, BigShot Die Cutting Machine, Ranger Distress Ink Foam and Handle, pop dots, adhesive runner, water, mist bottle, MISTI stamp tool, ColorBox Fluid Chalk Ink - Dahlia, Zing white embossing powder, heat tool, painters tape, hot glue gun, glue sticks, VersaMark Ink. Instructions: Create a 6" x 6" card base from white card stock. Locate decorative 6" x 6" card panel for background as shown. Trim down slightly smaller than card base, ink all edges using ColorBox Dahlia Ink, and adhere to card base. Locate and cut out small premade card base with bird house and birds as shown. Using the coordinating die in the Cut Mat Create 1A collection, die cut center image. Ink all edges of the frame and die cut image using ColorBox Dahlia Ink. Using MISTI tool, stamp sentiment from Raindrop Sentiments Cling Stamp Set onto image panel. Adhere image panel to card base using adhesive. Locate the two matching decorative die cuts in the Delicate Border Basics Dies. Position the two dies back to back onto white card stock so that they will cut together to create one embellishment. To do this easily, position them together and use painters tape to secure them to the card stock. Trim and add to frame from which you cut out the bird image. Adhere frame to card base over top bird image using pop dots. Stamp the bird on branch image from the Songs of Spring Cling Stamp Set onto white card stock using VersaFine Black In. Die cut using the coordinating die. Using Stack and Store Daubers, color the image using ColorBox Creamy Brown ink for branch, Ranger Archival Inks - Leaf Green and Olive for leaves and Memento Inks - Danube Blue and Potter's Clay for bird. Shape slightly using Deluxe Flower Shaping Kit and adhere to card front as shown. Stamp two inkings of the petals from the Large Sweet Peony Cling Stamp Set onto white card stock using ColorBox Dahlia Ink. Stamp one inking of the largest flower base from the Peony Bud and Blossom Cling Stamp Set. Using Stack and Store Daubers, color all pieces using ColorBox Berrylicious and Memento Peanut Brittle inks. Die cut using coordinating dies. Repeat coloring process on back of die cut images. Ink all petal tips with ColorBox Dahlia ink. Shape peony petals using 3D Floral Basics Shaping Mold. 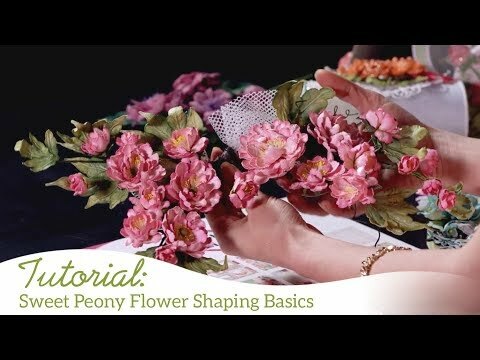 For full instructions on how to shape the peony flower using mold, please see video listed in link above. Finish shaping process using Deluxe Flower Shaping Kit. Layer two largest petal pieces together and then the smaller petal pieces in the center to form bud using hot glue gun to ensure a quick bond. Adhere peony flower to card as shown. Stamp one inking of all leaves from Large and Small Peony Cling Stamp Sets onto white card stock using Ranger Archival Olive Ink. Using Stack and Store Daubers, color leaves with Ranger Archival Leaf Green ink and then die cut using coordinating dies. Ink all edges of all leaves using Ranger Archival Olive Ink. Adhere leaves around peony blossom on card front as shown. Stamp one inking of each of the smallest petal pieces from the Small Sweet Peony Cling Stamp Set onto white card stock using VersaMark Ink. Sprinkle with white embossing powder and heat set using heat tool. With fingers, sprinkle Aged Ivory Embossing Enamel onto petal pieces and heat set from the underside of the card stock until embossing enamel has melted. Die cut using coordinating dies. Send petal pieces through flower shaping mold. 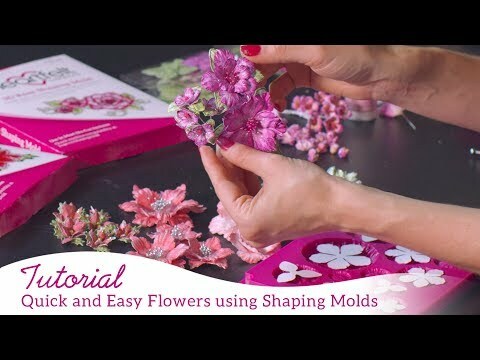 Finish shaping using Deluxe Flower Shaping Kit. Create two double blossoms by nesting one smaller peony petal piece into larger peony petal piece. Adhere around large peony as shown. Adhere small single peony flowers to create cluster as shown. For finishing touches add white Minnie Pearls Prills to white flower centers, and Heart of Gold Prills to large Peony Center. Apply Baby's Breath Glitter to large peony petals as well as preprinted focal image using a dries clear glue and metal tip for adhesive bottles. Apply Ivory Seashell Nuvo Drops to card base as shown.